Those of you who follow me on Twitter, may have seen that I'll be off on holiday to Bali for two weeks! Even though there wil be free WiFi where I'm staying, I didn't relish the idea of blogging about the upcoming Tube strike while I'm lying on a sun lounger. It'd hardly be authentic too! However, I know a lot of people visit the blog looking for help, advice & a general place to moan about the London Underground during strikes. So rather than leaving a gap, I've lined up a great guest blogger for you. Many of you might know IanVisits and I was delighted when he kindly agreed to step in for me. Ian's a perfect choice, as he knows more about the London Underground than I do. He's been commenting & sending me stuff to blog for many years now. As well as blogging himself, he runs a ridiculously comprehensive events calendar packed with interesting things to do in London (no idea how he finds out about good events so quickly!). 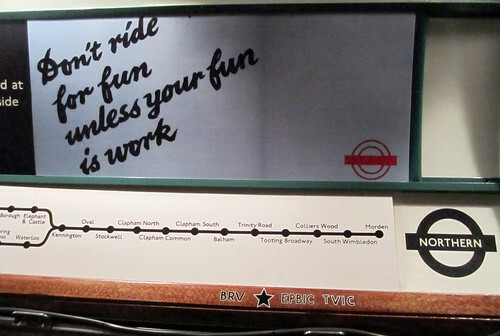 He's blogged and photographed some wonderful Tube related tours - including West Ashfield, Brunel's Thames Tunnel walk and a visit to the disused platforms at Charing Cross on 1938 Tube stock. I first met Ian at launch of London Transport Museum's Art of the Poster exhibition two years ago. He's also been following London Underground & union politics, so I'm happy to leave in his capable hands for two weeks. In the meantime please welcome Ian (he's IanVisits on Twitter) and I'll be thinking of you all on Sunday & Monday battling to get to and from work. Good luck! Looks like the Tube are taking advantage of the grime on the system to do a branding exercise. James Cridland spotted a large roundel drawn in the dirt at King's Cross Piccadilly Line platforms. This is not the first example of "reverse graffiti" seen on the Tube. 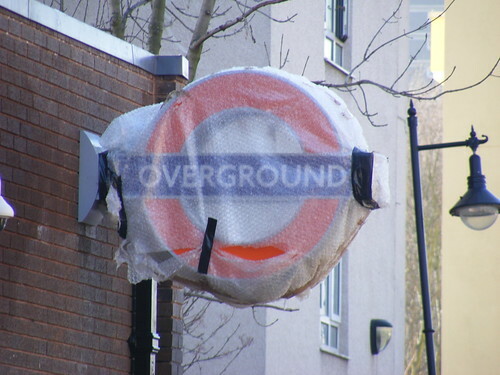 I spotted the above at Aldgate earlier this year, which obviously isn't as "on brand" as the roundel. Wonder what other messages will appear in the dirt? Although maybe this is a sign of things to come. Perhaps TfL could make some revenue and save on cleaning costs by sponsoring "dirt advertising spots". Just wish I could think of a better name for selling it to them. Ideas most welcome! Earlier in the week, I saw someone running up a down escalator and that confused everyone else from the looks he was given. He may as well have been naked. Any chances of the next set London Underground strikes being called off have failed. The talks with ACAS fell apart yesterday. Apparently insufficient progress was made in the talks. A spokesperson from the conciliation service ACAS said that the parties have left to reflect their positions. The next Tube strike will take place from 9pm Sunday October 3 for 24 hours. Further strikes are set for the same time Tuesday November 2 and Sunday November 28. 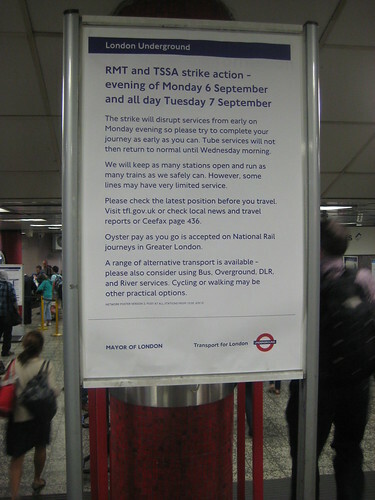 The previous strike on 6th - 7th September was hailed as solid by the Socialist Workers Party. However there were signs that we might face more than 24 hour strikes in the future. A Socialist Worker supporter on the Tube said "We have a lot of strengths but a series of 24-hour strikes is not guaranteed to win. There are two immediate problems—the first is that in a few months all the jobs we are fighting for will be gone. The second is that management is implementing reorganisation with reduced staffing levels. "We need to build up workplace organisation on the ground to be able to deliver more than 24 hours." Sounds ominous for us commuters. In the meantime, as before, it's impossible to predict the impact this next strike will have on the service, but all lines are likely to be affected. Look out for information on TfL's website nearer the date. 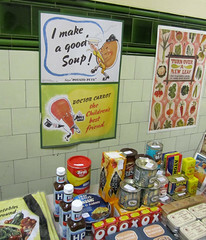 London Transport Museum are holding another set of fun photographic scavenger hunts. This time it's to celebrate the opening of the new London Overground line. Teams of photographers will unlock cryptic clues to snap transport treasures and local gems. Prizes will go to the first team home (with the most correct answers) and bonus goodies will be awarded for best pictures uploaded to Flickr. You can be part of this, and choose from 2 photographic scavenger hunts - one in East London and one in Croydon. You'll need a Flickr ID to register and the event may involve travel so make sure you have your Oyster Cards ready! They're happening on Saturday 9th October with an 11am start. Places are limited, so to book your place contact Jane or Michelle at communities@ltmuseum.co.uk with your Flickr ID and let them know which location you'd like to explore. More details are available at the Overground Uncovered Flickr Scavenger Hunt site. I've been to and helped to arrange a number of these in the past (including Transport in Miniature at Acton & London Festival of Architecture hunt) and they're great fun, plus a very good way to test your knowledge of London & get you to look out for things you normally wouldn't have noticed. Thanks to Andrew Smith for the heads up on this. It's Hobbit Day (the birthdays of Bilbo & Frodo Baggins). 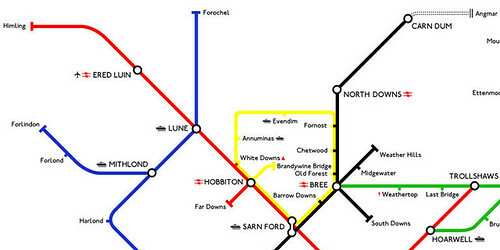 So what better way to celebrate than a look at the "Tube stops" in Middle Earth. It's a great way to "help the average joe understand its geography better". Before I knew it, I started mentally picturing roads and locations on Middle-Earth maps as railway lines and stations! I then began designing on top of Middle Earth maps as templates for accuracy." 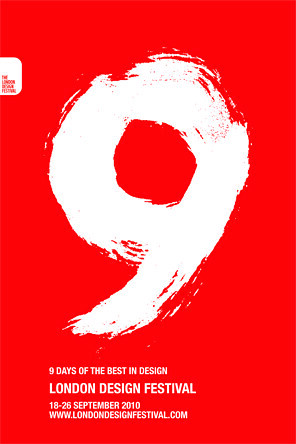 The design comes in a T-shirt and a poster. One suspects the whole Lord of the Rings trilogy of films would have been a tad shorter if Frodo had been travelling around by Tube. Perhaps the Nazgûl could have battled it out with the RMT and TSSA to stop any chance of a Tube strike! Thanks to @jamescridland this is probably the closest you'll get to finding how to get to Albert Square by Tube. 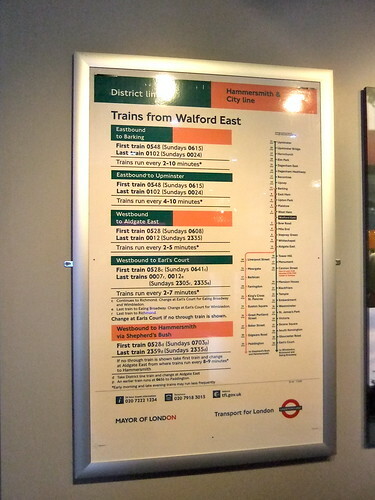 James spotted the London Underground poster showing "Trains for Walford East" at the National Media Museum in Bradford. You'll never hear any of the characters from EastEnders talking about going to Bromley-By-Bow, as this station is replaced by Walford East on their fictional Tube map. Apparently there has been mention of a Walford West station, but looking at the poster it doesn't appear to be on the District Line. 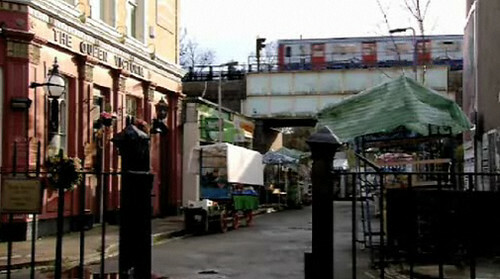 Walford East Tube appears quite often in EastEnders now, usually when one of the characters is running away from home. I imagine Peggy Mitchell was probably sashayed her way towards it when she made her exit from the show a few weeks ago. Also since February this year, CGI effects were used to show District Line trains hurtling through Walford on a regular basis. Now all we need are some of the characters to moan about the next Tube Strike in October and we'll have an even more realistic use of the London Underground in Enders! Speaking of strikes - talks take place later today to try to stop the next set which are scheduled for 3rd October, 2nd November and 28th November. 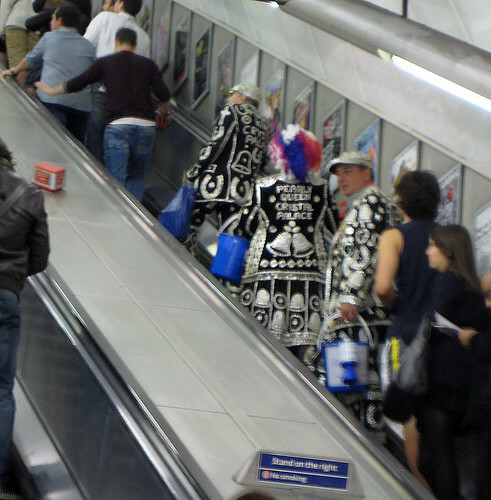 I don't think I've ever seen a Pearly King or Queen on the London Underground before. So it was quite sad to see them standing & squashed in their glittery finery on a crowded train on Saturday. They're like "London Royalty" aren't they? Surely people should have stood aside or demanded they were given seats! Perhaps Boris should decree them automatic Tube seat rights. Joking aside, they seemed reasonably happy standing. Although the shot of the man above does look a little melancholy. Unless he was just thinking about his next meal of jellied eels! They got off at the same stop as me at Holborn and when they were going up the stairs, it was clear people now noticed them. I heard a number people pointing them out to their friends, like a breed of exotic bird had flown into the Underground. Exiting at Holborn, I managed to grab a blurry shot of them on the escalators. They certainly added a nice bit of sparkly East End glamour to the Tube. 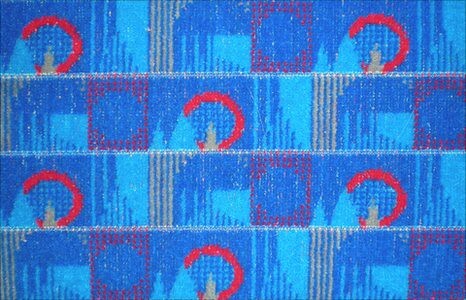 If you've ever wanted to learn more about the history of London Underground's iconic upholstery (moquette), London Transport Museum are running an evening of talks and a "make & take workshop" on Wednesday 22nd September 2010. London Underground's Design & Heritage Manager Mike Ashworth will look at why London still uses woollen fabric's (almost unique in the subway world) and how this fits into TfL's corporate identity. You'll also hear from Wallace & Sewell the design duo who created the brand new moquette (pictured above) which will be on used on refurbished Central Line trains from 2011, and other new trains. They will discuss the challenge of designing within very tight parameters - 4 colours - exact repeat size - then working with a mill to translate the design into fabric. If you look closely into the new design (known officially as Barman) you can see a Londony skyline with the London Eye. The evening will also include exclusive tours of the Museum's Design for Travel gallery. You can finish off the night with a moquette themed make-and-take workshop with The Make Lounge where you'll be able to design and decorate a set of two moquette patterned drinking glasses. Tickets are £18 adults; £15 Students; £12.50 Friends / TfL staff / concessions and the event starts from 6.30pm and finishes at 9.30pm. Tickets for this event are limited and can be reserved in advance, so call 020 7565 7298 to book your tickets now. Remember those lovely looking wooden Oyster card holders I blogged about a year ago? Well, to celebrate this year’s London Design Festival, TfL have got together with design company Tom Dixon & launched a new limited edition Routemaster Oyster Card holder. 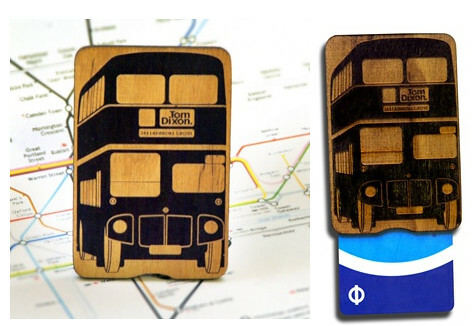 Etched with the iconic bus, the wooden holders are £19.95, but you have the chance to get your mitts on one. Look out for the poster below (apparently they're all over London), get a picture of you standing in front to it, send to London Design Festival, tell them where you took it and they'll give a holder to their two favourites. You've got until Sunday 26th September to get snapping. Full details are here. Good luck! Over 700 of London's interesting buildings will open up their doors to the public for free this weekend. 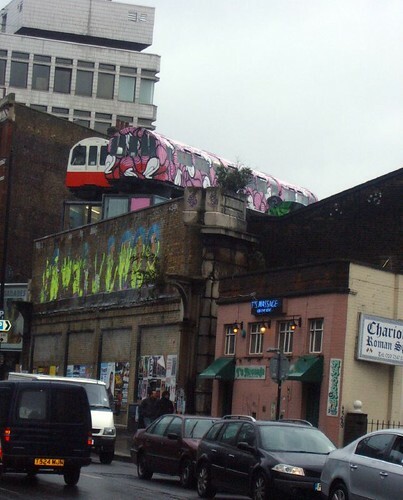 Once again you'll get an opportunity to visit Village Underground - or as I like to call them "Tube Offices in the Sky"
They're a collection of old Tube trains hoisted onto a disused viaduct in Shoreditch and have been made into working offices. Here's my post when I was lucky enough to visit them a few years ago as my friend's theatre company was based there. Tours are taking place on Saturday at 11am, 1pm, 3pm and 4.30pm on a first come first served basis (queuing outside if necessary) - full details here. They're well worth a visit and you get to see as pretty interesting view of the City from up there. Wonder if there will be an announcement this Friday night about congestion on the London Underground due to a Papal visit? I was quite pleasantly surprised to see advance warning about this. Although maybe Tube stations won't be as busy as TfL think as numerous tickets are said to have gone unsold and event capacities reduced. 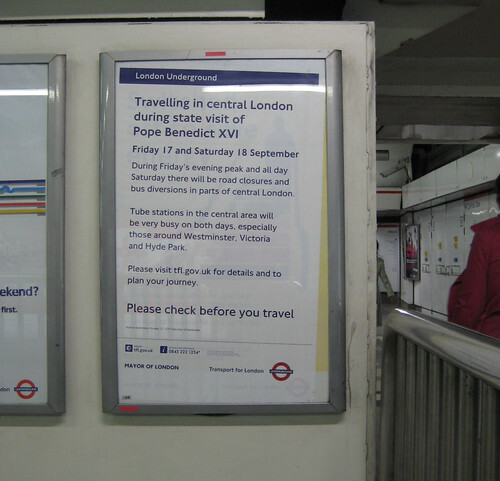 There was also something quite weird about seeing the following line in the paragraph on coach visits on TfL's page dedicated to Pope Benedict XVI's visit: "Pilgrims are advised to complete their journeys on public transport." Just because you might be curious to see the Pope, does that necessarily make you a "pilgrim"? Does the very act travelling by coach automatically turn you into a "pilgrim"? 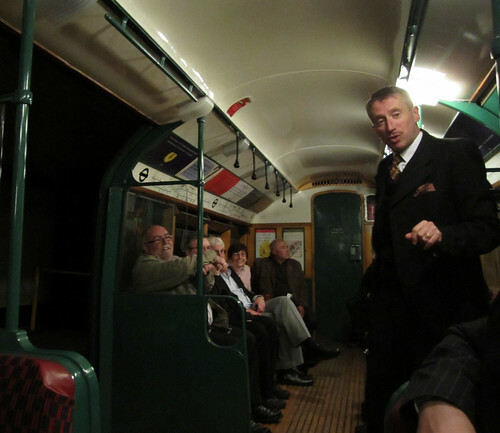 "As part of Illumini’s festival of subterranean London the group were promising Mysteries & ghosts of London Underground a talk by a member of London Underground staff about the ghosts and ghoulish goings on of our ancient Tube system. 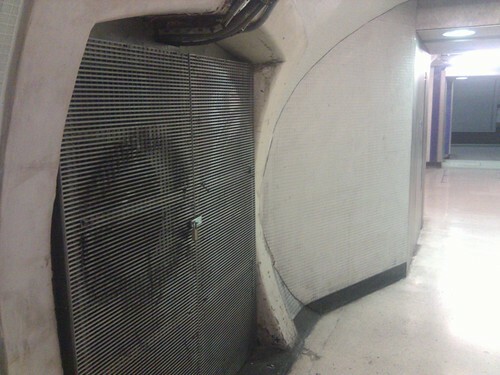 Our host told us you wouldn’t hear much about spook stories from the Tube staff as it was a topic they were dissuaded from talking about but despite the hush-hush nature of the stories there were lots to share. 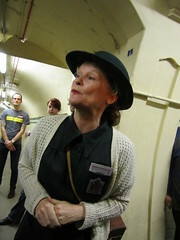 Popular cases such as The Passenger, a ghostly imprint on a CCTV system, the Black Nun of Bank station, the Highgate ghost train and the weeping women and children of Bethnal Green may not have been new to the packed out audience but were much more entertaining told in the crypt of Shoreditch Town Hall. With the idea of death all around us the destruction of crypts, plague pits and mass burial grounds seemed a little bit closer than on the well lit carriages we spend too much of our time on. 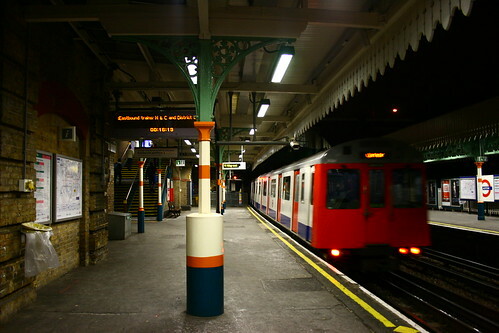 "The horribly haunted tales of Kennington Loop, where invisible hands slam the doors between carriages on empty trains; York Road’s rotten meat smells, possibly strengthened by the refusal of many cleaning staff to enter and the start of the Bakerloo line in Elephant and Castle, having a walled off plague pit hidden behind the brick face at the end of the tunnel, were shared. But these stories are not too far hidden from public consumption having been revealed in many subterranean London books and ghost guides of the city and the not so old Channel 5 programme Ghosts on the Underground (which you should definitely watch if you’re interested in ghost stories). The host’s personal experiences of exploring abandoned stations and boarded up doors on quiet parts of train lines were the real highlight. Having the opportunity to explore the tunnels under Waterloo with a colleague she stumbled upon a locked door that, on removal, surrendered secrets of its previous use as a morgue in WW2. Crumbling ledgers, now housed at the British Library, detailing dead bodies and lost limbs of the victims of the Blitz were lucky to be saved and hint at a hidden history we’re still stumbling on in the dark. The talk left me with a feeling I should definitely become a Tube driver so I could experience some of the horror first hand and bathe in a secret world of the London we non-Tube working people rarely get a glimpse of but this will most likely manifest into comfort in the knowledge that every now and then there’s a ghost on a carriage with me, or stood silently on the platform only to be ousted as such after hours when only the station guards are there to see." Thanks Charlotte for sharing that very insightful write up of the event. Ever thought you could do a good job with 48 sheets of space on the Tube? In zone one you've probably seen these ads from CBS Outdoor on the Tube. It's a collection of extremely short versions of popular stories. They're challenging creatives to come up with some with some long ad copy based around Londoners, the London Underground or Tube commuters. Nice for creative types. 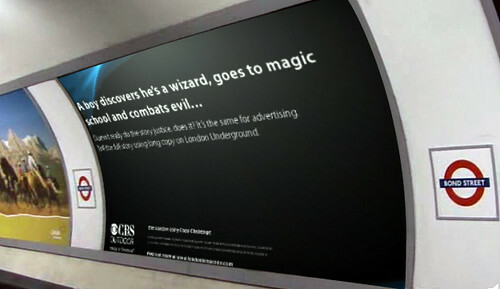 However, CBS Outdoor have very cleverly made a visualisation tool, so you can have a go at creating your own cross platform ad and see what it would look like in a Tube environment. I took about two minutes to come up with the one below (click to see the full ad in a video). 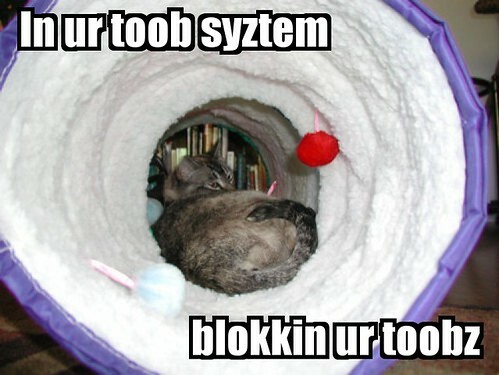 But with more time and imagination you can have some fun designing your own. If you're a serious creative and want to win £125,000 worth of Tube ads for your client or agency or take away one of four runner up prizes of your entry featured at Oxford Circus Tube for 2 weeks, click here. The rest of us can have minutes of fun seeing what our faces and swear words and LOL cats would look like on the Tube, with the visualiser. "Signalling irregularity" put two London Underground trains into the paths of each other on the Hammersmith and City Line yesterday morning. A westbound train was wrongly switched to an eastbound track after leaving Plaistow at 8.15am. A spokesperson for Transport for London said: "The driver, following London Underground's stringent safety procedures, stopped the train immediately, and our signalling system prevented any eastbound trains from moving towards the stationary train. "The nearest eastbound train was stationary at red signals almost a kilometre away at West Ham. "Passenger and staff safety was maintained throughout. The train had three passengers on board, who were all removed from it shortly after 9am. Our engineers are carrying out a full investigation into the cause of this signalling irregularity, and the Rail Accident Investigation Branch and the Office of Rail Regulation have been informed of the incident." The BBC report that services on the line were suspended for about six hours to allow investigations to take place. Initial findings seem to have have identified a fault with signalling equipment at Plaistow station. This incident comes less than a month after the runaway train on the Northern Line which is also under investigation with the RAIB. 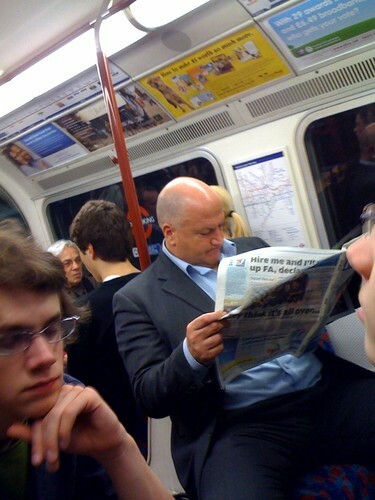 At time of writing there's been no statement from RMT union leader Bob Crow on this. After the runaway train on the Northern Line he was quick to use the incident to his advantage and said "This horrific failure comes against a background of a systematic reduction in safety-critical jobs and safety procedures as a direct result of TfL's financial cuts programme." 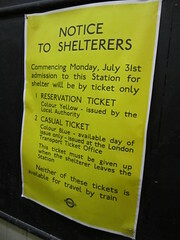 In what looks set to be an interesting set of blog posts, Nick Cooper is writing day by day reports of the Blitz's affect on the Tube. Using Ministry of Home Security Reports and records from the Commonwealth War Graves Commission, he'll be building up a daily picture of the London Underground 70 years ago. 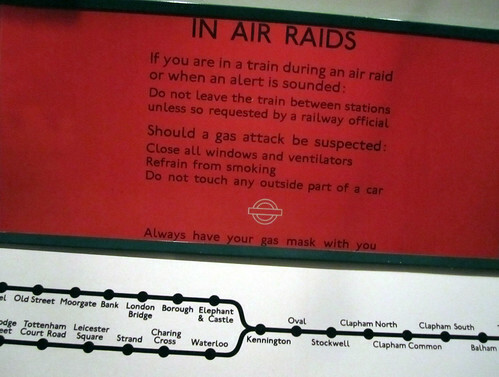 Also London Transport Museum opened their exhibition on the Blitz - Under Attack - yesterday. "The aerial bombing raids, known in Britain as the Blitz, defined the wartime experience of many European cities. 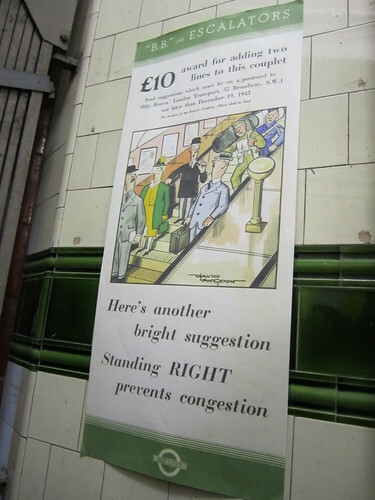 This exhibition tells the story from the perspective of public transport in London, Coventry and Dresden, and illustrates the struggle to keep these cities moving during the Second World War." 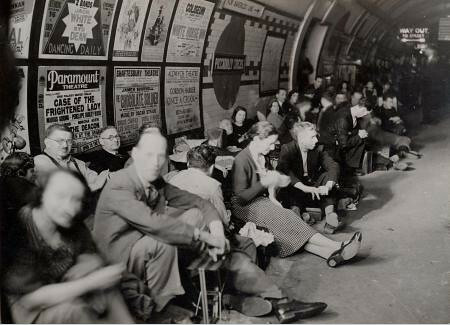 Don't forget there may still be tickets left for the tour of Aldwych London Underground Station, where you can see what life was like sheltering in the Tube during the Blitz. 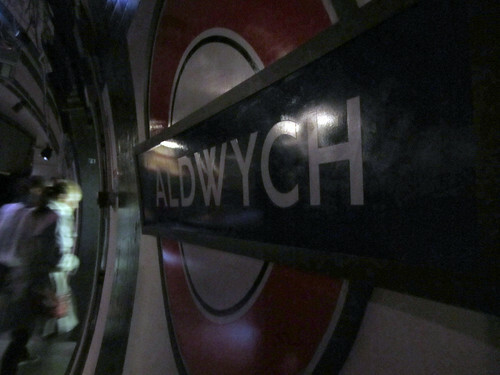 Very rare opportunity to have a tour of disused Aldwych London Underground Station. 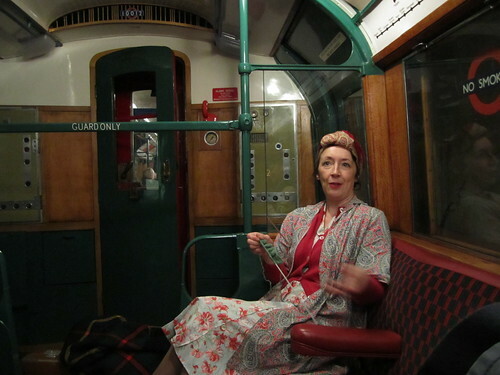 London Transport Museum are running tours led by actors portraying 1940s characters - including an ARP warden and a spiv, to give a look at what life was like sheltering in the Tube during the Blitz. Only a small number of people have been to Aldwych at platform level and it's expected the tickets (£8.50 each) will sell pretty quickly. They're running eleven 45 minute tours each day from Friday 24th September through to Sunday 26th September 2010. Both londonstuff and ianvisits were lucky enough to visit a few years back and took some great photos . 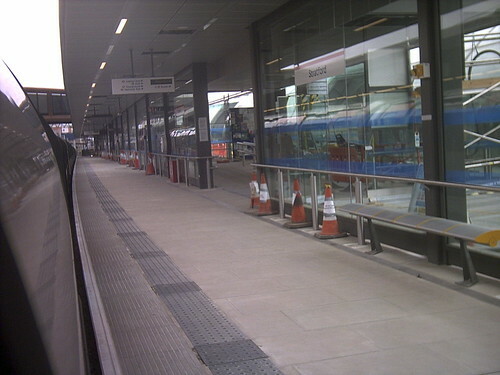 However, it's the first time since I've been blogging that public tours have taken place at platform level. A ticket hall exhibition took place earlier this year. Tickets for this event must be booked in advance and are in limited numbers. This is definitely an occasion when you should "book early to avoid disappointment". Telephone 020 7565 7298 to book your tickets. Update - the lines are really, really busy but London Transport Museum ask you to be patient. They have just tweeted that tickets for the tours can be purchased at the museum ticket desk if you are able to make it there. 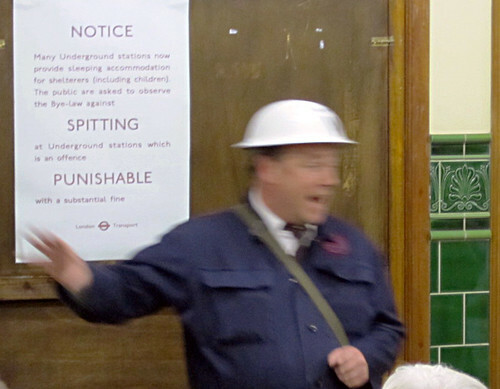 Update - 27th September - Here's my post of the Aldwych Underground Tour - it was a fascinating & moving experience! In case you've been living on the Moon, by now you'll know that 24 hour London Underground strikes will begin from tonight 6th September. 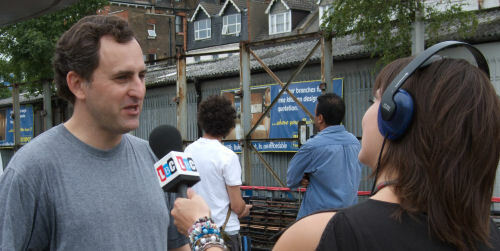 In a nutshell Tube maintenance staff begin their strike at 5pm. It's unlikely you'll experience severe disruption at that time, more of a winding down. Drivers who were due to start their evening shifts will not clock on. Station staff, drivers and signallers will start their strike at 9pm tonight. It's impossible to predict the impact this will have on the service, but all lines are likely to be affected. Blog Penalty Fares claim to have internal First Capital Connect memo where London Underground outline predicted service patterns on the lines. However, you should really check TfL's site and live travel news for the latest information. Meanwhile RMT are up in arms at TfL's attempts to get volunteers to help people's travel plans. TfL's website says these volunteers are "on hand at key stations to give alternative travel options and otherwise assist passengers." However, the RMT state "In a circular to staff desperately appealing for volunteers to help try and run some skeleton services LU say that those without the required Operational Licences will still be deployed and that those with lapsed licenses can have them renewed without complying with the normal training and updating programme ... the latest safety breaches go to the very heart of the dispute which is all about London Underground hacking back staffing levels and cutting corners on safety in a dash to slash costs regardless of the implications for the travelling public.."
I came across a video produced by the RMT with the union leaders justifying their strike action. Maybe it's just me but there seems to be very little discussion about safety. Bob Crow says towards the end "If you don't fight this you've lost. We'll lose the 800 jobs and they'll turn around at Broadway and say there ain't much fight in that lot". A pretty different Crow to the talks about safety supposedly at the heart of his more recent releases. Good luck to everyone making their way home tonight and getting around tomorrow. Remember that the staff you see during the strike will be doing their best to help you and deserve your co-operation and support. Please let us know how you get on with your journeys and how you managed to get on. As part of the 'Secret Subterranean London' event hosted by Illumini, there are two free talks shedding light on some little known underground topics. In What Lurks Beneath - spirits and spectres of subterranean London - Rosie Murdie, ghost investigator and member of The Ghost Club will tell some of the ghostly tales linked with the city. You'll find out more about the actor that supposedly haunts the tunnels of Covent Garden London Underground station, plus other ghostly tales. That's at 4.30 on Saturday 11th September. If you miss that, a member of London Underground Staff, will give another talk on Sunday 12th September at 3.30 covering the "baffling mysteries & ghosts in the dark dank recesses of London's Subterranean Tube System". 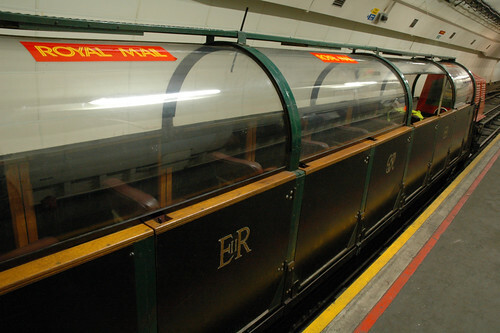 Also, Chris Taft, the curator of the British postal museum and Archives, will give a talk on the Post Office miniature underground railway, which was used to carry post through central London. The talk includes rare video footage of the underground railway and the train, which is no longer in service. This will take place on Sunday 12th September at 11am. Update - @CTrouper went along to the Underground Ghosts talk and wrote an insightful guest post for this blog! 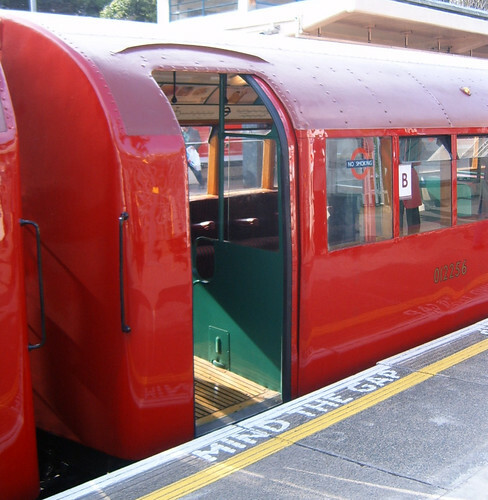 Update - 7th September 2010 - Both 1938 Tube train and Sarah Siddons, whilst having their final maintenance checks*, will be unable to run at the Amersham heritage day this Sunday. 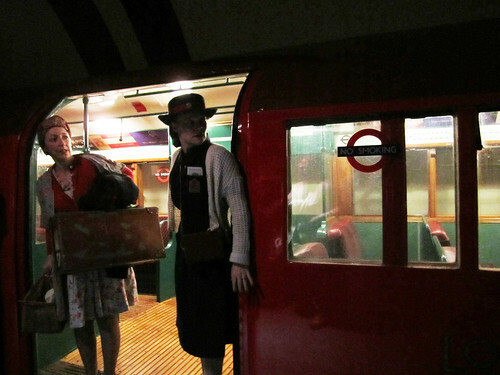 London Transport Museum say: We would like to apologise for any inconvenience caused by this late cancellation. We are in the process of trying to secure future dates and will publicise these as soon as possible. For those who have bought tickets please be advised that we will be in touch by telephone ASAP. Please do not phone our booking number as it is currently extremely busy and you may not get through. Shame - here's what you could have seen..... 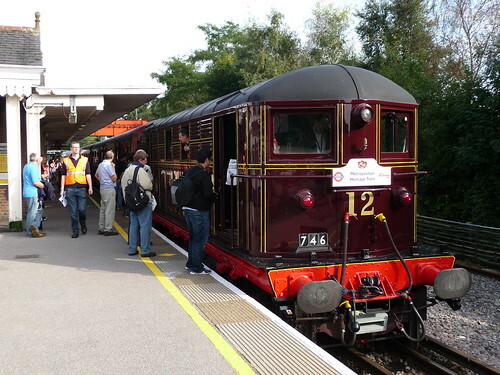 This Sunday 12th September 2010 London Transport Museum are running two special heritage train journeys. 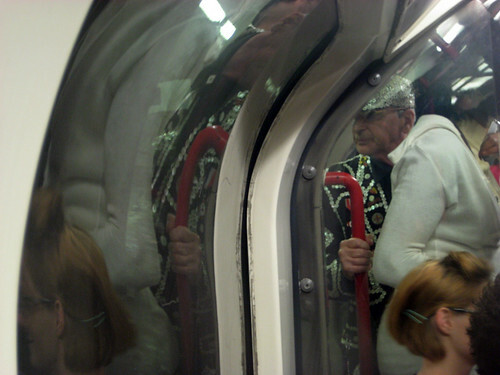 I was lucky enough to travel on the art deco 1938 Tube train a few years ago. All tickets include free travel on Sarah Siddons - the oldest working main line electric locomotive in Britain - subject to availability. You can can travel separately on this train as it makes special trips between Harrow-on-the-Hill and Amersham. "Engine no. 12 , Sarah Siddons, was built in 1922 and is the last operational Metropolitan Railway electric locomotive; the only surviving working engine out of 20 built by Metropolitan Vickers and named after real or fictitious people associated with the area served by the Metropolitan Railway. The engines had a top speed of 65 miles per hour." said London Transport Museum. This 'battery farm' would be the first of its kind in the UK, with over 8,000 Holstein cows being cooped up in tiny enclosures 24/7 for at least ten months of the year. Compare this to normal herds with just over 100 cows free to roam the fields. The Londoneer has more on this in his blog post. 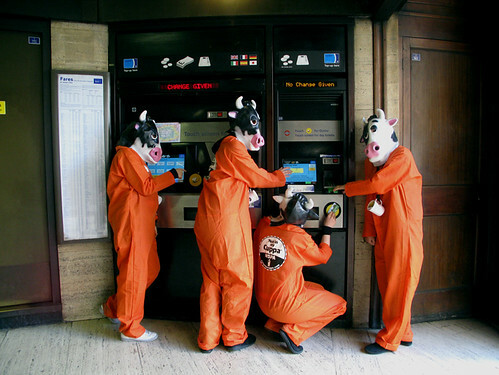 Cows seem to be getting a raw deal at the moment if their number of Tube protests is anything to go by. 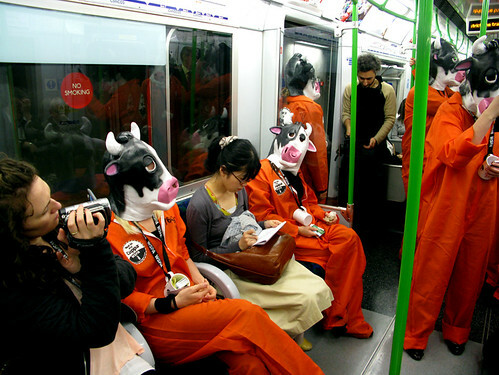 Let me know if you spot any other strange animals on the underground. Any chances of Monday's London Underground strikes being called off have failed, as the talks with ACAS fell apart today. The RMT stated they had "made it crystal clear that there can be no compromise on safety and safe staffing levels – the failure of LU management to recognise that, and to lift the threat of cuts to allow talks to proceed, sabotaged the ACAS negotiations." Ex-Metronet (maintenance and engineering) staff will begin their first 24-hour strike at 5pm on Monday September 6, with similar action also scheduled to begin at the same time on Sunday October 3; Tuesday November 2 and Sunday November 28. All other London Underground workers including station and revenue staff, operational managers, drivers and signallers will start their first 24-hour strike at 9pm on Monday September 6, with similar action also set to start at the same time as the other strikes above. Union leader Bob Crow who insists the dispute is about safety as well as job cuts said "RMT and TSSA have been presented with a stark choice. We could sit back and wait for a major disaster while safety cuts are bulldozed through turning the tube into a death trap or we can stand up and fight for passenger and staff safety. On Monday we will be making a stand on safety and safe staffing levels on behalf of all Londoners." At time of writing there has been no statement from TfL over the break down of talks. All Tube lines will suffer some disruption from delays to full or part suspensions. Before you leave work on Monday night, check TfL's website for the latest on the exact situation and be prepared for continued disruption on Tuesday. Update - 3rd September - TfL have released their plans as to how they will help travellers during the strike action. 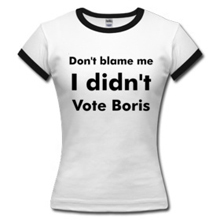 Boris Johnson added "Londoners are a hardy bunch and I am sure a Tube strike will not deter us from getting around. I have asked TfL to pull out all the stops. But we must be clear that the RMT and TSSA plan to inconvenience Londoners for no good reason....this planned action will cause disruption for millions of Londoners and I call on the unions to get round the table and show common sense." 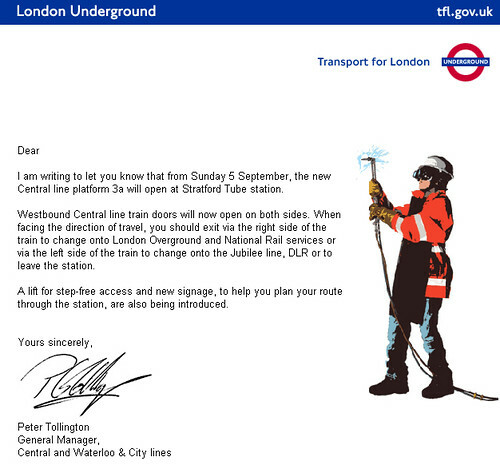 From 5th September the new Central Line platform 3a will open at Statford Tube. Not only that, but the train doors will open on both sides. That's something that doesn't normally happen on the London Underground. An email forwarded to me by London Lass helpfully explains "Westbound Central line train doors will now open on both sides. When facing the direction of travel, you should exit via the right side of the train to change onto London Overground and National Rail services or via the left side of the train to change onto the Jubilee line, DLR or to leave the station." Mmmmm I'm already confused. I wonder how many others will be too? London-Lass was sceptical and at first wondered if the email was an April Fools come early! Is this going to make the age of problem of people barging onto trains before others have got off even worse? There's bound to be a certain amount of dithering from travellers trying to work out which side they should exit. It's supposed to reduce "dwell time" at the station as in the past TfL acknoweledge there were issues "with legacy signing in the rail/ underground station creating uncertainty on the Central Line/ mainline rail platforms and capacity increases are beginning to impact on movement in the eastern entrance, beyond the gate line at the foot of the stairs to the mezzanine level." Time will tell and in the meantime let's hope that the Tube drivers remember to open the doors on both sides.